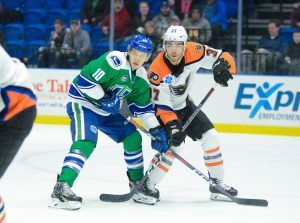 Utica, N.Y. – The Utica Comets struck for four goals in the third period to overcome a 2-1 deficit at the second intermission and turn the tables on the Phantoms in a 5-2 victory on Friday night. Lehigh Valley had previously boasted a record of 17-0-0 when leading after two periods and were one of only four teams with a perfect record in such situations before this first setback. The game pitted the two oldest and most-traveled goalies in the American Hockey League. Mike McKenna, 35, took the crease for Lehigh Valley which is his AHL record 13th team in his career. 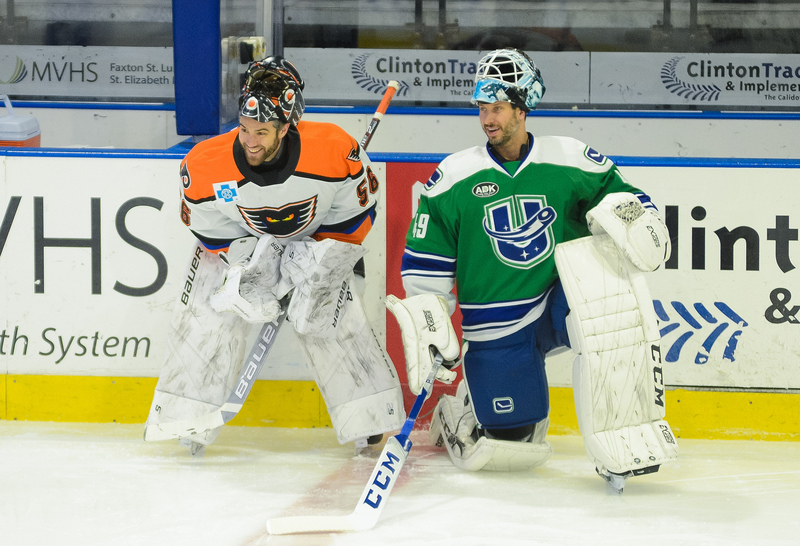 Michael Leighton, 37, was the starter for the Utica Comets. The former Adirondack Phantoms and Philadelphia Flyers netminder is second all-time with 12 career AHL teams and has an AHL record 50 career shutouts. The two venerable and veteran goaltenders appropriately began the game in an old-fashioned style goaltenders duel with a number of sparkling saves in a 0-0 frame. But Lehigh Valley (25-18-5) broke through in the second period on consecutive goals just 45 seconds apart by Justin Bailey and Philippe Myers in building a 2-0 lead. Bailey scored for the fifth time in the last five games by corralling the rebound of is own shot off the right pad of Leighton and offering a following up from the side of the net behind the goal-line that he successfully banked in. Connor Bunnaman recorded an assist on the play in his first game back in the lineup after missing a couple of weeks. Then it was Myers turning the corner on a defender past the left wing and carrying the puck straight to the net. Myers went right around Leighton from left to right and used his long reach to flip the puck past the extended left leg of Leighton for a 2-0 lead. Myers ninth goal of the season was also the first that he has scored from in tight. Most of his goals come on slap shots from the blue line. Utica captain Carter Bancks put the Comets on the board 6:28 into the second period on the rebound of a point shot by Jamie Sifers. But McKenna made a number of nice saves for the rest of the period to keep the Phantoms ahead by a marker. 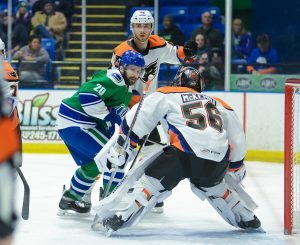 The Comets struck for three goals in the first 4:22 of the third period to turn the tables on the Phantoms beginning with Ashton Sautner’s wrister from the left point that eluded McKenna for a 2-2 tie. Reid Boucher (20th) offered a push from the right do that sneaked through the right skate of McKenna for the first Comets lead of the game at 3:54 into the third. And just 28 seconds later it was NHL veteran Tom Pyatt (3rd) burying a back-door conversion to cap a 2-on-1 with Brendan Woods. Brendan Gaunce capped the scoring at 10:46 into the third on the doorstep with the puck around the right pad of McKenna following an outside shot. The Comets out shot the Phantoms 33-27. Lehigh Valley was 0-for-3 on the power play while holding Utica to 0-for-1. The Phantoms penalty kill (88.4%) continues to rate first in the AHL and has been successful in 31 out of 32 kills over the last eight games. The Lehigh Valley Phantoms return to PPL Center on Saturday night and Sunday afternoon for back-to-back showdowns with the Hartford Wolf Pack. The affiliate of the New York Rangers have dropped nine straight to fall into the cellar of the Atlantic Division standings. Sunday’s game features a Phantoms and Carter Hart wall-cling giveaway for the first 2,000 kids presented by PSECU. 1st Period- No Scoring.Penalties-Swavely Lv (interference), 5:55. Shots on Goal-Lehigh Valley 6-12-9-27. Utica 9-12-12-33. Power Play Opportunities-Lehigh Valley 0 / 3; Utica 0 / 1. Goalies-Lehigh Valley, McKenna 4-4-0 (33 shots-28 saves). Utica, Leighton 3-2-0 (27 shots-25 saves). Referees-Conor O’Donnell (41), Brandon Blandina (39). Linesmen-Frank Murphy (29), Jason Brown (44).